Trekkies, here is something for you! 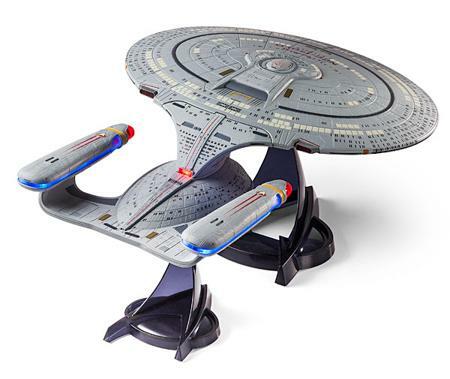 The $59.99 Star Trek TNG Enterprise D Ship would certainly make any Star Trek fan drool at the mouth, or if you are a seasoned fan who has seen and done it all, how about just licking your lips in anticipation? The Star Trek TNG Enterprise D Ship comes across as a detailed 17″ model of the USS Enterprise-D, and as you use your imagination to “fly” it through new frontiers, coming across imaginary aliens and being involved in epic space battles with the narrowest of escapes, it will also be made all the more realistic with the inclusion of sound effects and sayings by good ol’ Captain Picard. The engines will be able to light up, and to further tickle your imagination, there is a separating saucer section to remain true to itself. It is best to “play” with the Star Trek TNG Enterprise D Ship when all the lights in your room are turned off in the middle of the night, as space is always dark. The separating saucer section is held together by a magnet, and it is powered by a trio of LR44 batteries while a trio of AAA batteries would keep the main segment of the ship going.